As an addition to range of laser diode modules a selection of high quality Fibre Laser Modules have been introduced. These are useful in applications where the laser beam needs to be positioned separately to the drive electronics or installed in hazardous environments. An examples of this, include situations where interference such as heat and static would cause damage to the drive electronics. Fibre Lasers open the possibility of moving the laser output into a controllable and flexible form making a wider range of applications possible. Ranging from violet through to infra red wavelengths with different optical powers and thermoelectric cooler (TEC) controls are available covering many different applications. Applications include material processing, broadband telecommunications, spectroscopy and medical uses. The module can be mounted on to a control board which, when installed can be temperature and humidity controlled in a more suitable environment providing a long life and more reliable solution. 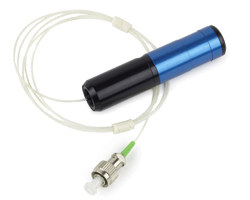 Our FibreLyte range is designed to meet our high quality standards and deliver excellent performance capabilities that have become to be expected from Global Laser. Please contact us directly for a custom solution not mentioned in the product documentation.